EPOLA WEBSITE now OPEN in CHINA! The 'PAPERBACK' (below) has now been made available in Chinese from June 2012. Professor Menahem Simhony was honoured for his epola model at a presentation in Jerusalem on 10th November 2009. 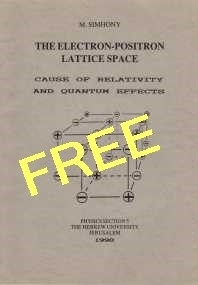 Introduction to the Electron Positron Lattice (epola) * Includes highlighted links to Dr Allen Rothwarf's Aether model (ref 1) and to papers by Dr.Montemayor Aldrete et al. (ref 7) on a Crystalline Vacuum Cosmic Space Model. Poster 2017 (pdf) showing summary of theoretical & EXPERIMENTAL investigations of epola structure. 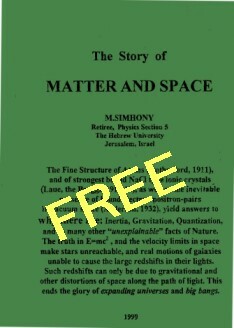 'The Electron-Positron Lattice Space' (1990), (the "PAPERBACK")and "The Story of Matter and Space" (1999), (the "BOOKLET)"- available for immediate free download. as pdf files - Click on these images of the books for information. * press the F5 key to refresh your page cache if updates do not show on your computer. 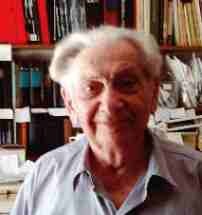 Prof Simhony was accorded the honour of Prof Emeritus of the Hebrew University, Jerusalem in Oct 2006. Please include "positron" in the subject line to identify from spam! Hosted by R. Guy Grantham. Lincoln. UK. Updated: 10Mar2007 - added booklet dwnld./ rev dec07e/intro page.updtd linksApr07 General review all pages Jun/Jul 07 paperback dnld added 10jul07, New flag chged to Free 13nov07, Gen revision of Intro 12Mar08 correction of name Montemayor Aldrete 11Jun08. "APS abs. from Mar99 added 02Jul08;FAQ ref pion Aug08. FAQ6 rev 24sep08 Paperbk and Booklet pdf files rev 12Mar09 UPdated news MS prestn lnk, topical updates, rev of pbk 16Nov09. FAQ1, PM flash, scroll last_update box5th Mar2010; faq1 3jul10 added Recent Papers sectn 16Sep10, papers added Jan 2011, revised refs to papers and tidied fonts, styles 29Apr11. 16thJun11:Updated age MS and logo to papers.rplaced 2links in faq 2. 3Jul11replaced LSU by USN link to xstl 19Oct11 Added Zhang's website 01Nov11 repaired link to Hbk book WorldSci 19Nov11 added alpha paper draftE 20Nov11 added 2008 ZEKE expt, tidied f/p layout.Update FAQ11/FAQ21. 26Jan12 added to ref3 in Introduction. Update box reformatted. 11jun12 upd Zhang site link; 30Aug2012 link to new paper, 30Aug12 added Vigeir-BCS submn. 20th Sep12 Added form for alpha as sep paper from App of Vigier subm., 6Apr13 added draft DM paper to Dev section;12Apr13 extended FAQ8, added refs to Levy papers in FAQ4. 29Apr13 added cookie warning panel to f/page & Click to txt over pbks 1Aug13 updated Draft Dark Matter paper to v6d. 28Sep13 edit intro essay, upd draft DM to6e and chg txt colour of cookie warnings. 12/1/14 upd frontpage link to draft paper added DOI lnk to 2012conf proc. Cookies are used for you to move around the site and for website info. like the most popular pages and any error pages you see. We use this aggregated information to improve our website - it never identifies individual users. I have worked in chemical research and manufacturing industry until retiring from the position of Technical Manager in 1999. My interests include techniques of analytical chemistry, photochemistry and process technology but with an overriding passion dating from about 1970 for theoretical physics. The epola model provided an explanation for most if not all of the hitherto unresolved mysteries I addressed whilst trying to develop my own theory of everything. I hope you will find time to explore and enjoy the potential of Professor Simhony's epola model for yourself. Please feel free to contact me at rgg@epola.co.uk and discuss its implications.